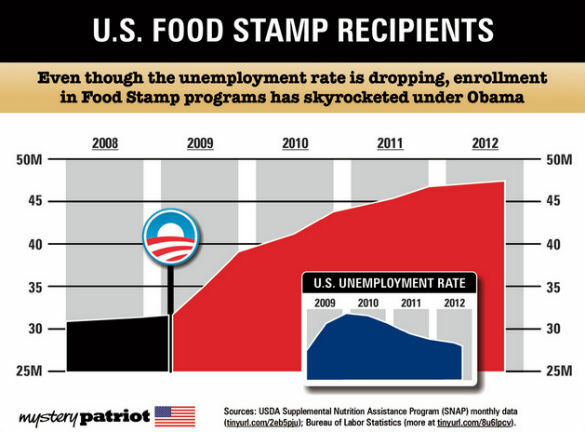 In the past, the number of Americans on food stamps has always been taken as a negative economic indicator. Especially whenever there is a Republican in the White House, the media has taken any growth in the number of food stamp recipients as proof that Republican economic polices aren’t working and people are hurting. So what should we say about a President whose policies have led to one in five American households to receive food stamps, with over one million individuals being added to the food stamp rolls in 2013? How do you square the vast increase in spending on food stamps (a 164% increase over the past decade) with the idea that eleven million or more illegal aliens should be “legalized” and made eligible for citizenship and government benefits, such as food stamps? The answer is you can’t, unless you plan to “remake” America. Back in the early days of the Republic, say in 1980 when Ronald Reagan was running for President, the notion that the welfare state had gone beyond being a “hand-up” and become a “handout” was accepted by most Republicans and even some Democrats as the truth. The Contract with America Congress eventually forced President Bill Clinton to accept major welfare reforms and the path to a job and a reduction in government dependence opened for millions of low income people. Jason Turner—a visiting fellow at the Heritage Foundation—argued that “the political left believed in a hospital model of the poor: caretaking and compassion with low expectations.” America's conservatives expected more. And as it became clear to welfare recipients that the rules had changed, many of them began meeting those expectations. The election of Barack Obama as President quickly returned America to that “hospital model” of how to help the poor, not because it worked better, but because it advanced Obama’s leftist political goal of creating more dependent “clients” for the ever-expanding welfare state the President and his leftwing allies in Congress were trying to create. And when they lost in Congress they simply ignored the law. As Robert Rector, writing for The Heritage Foundation noted, “As the Democratic Party shifted leftward after 1996, opposition to work requirements intensified. When TANF [Temporary Assistance for Needy Families] faced reauthorization in 2002, liberals aggressively sought to repeal the federal work standards. In 2006, they repeated the attack. For the most part, liberals lost those battles. Unable to roll back workfare legislatively, the left has now used an illegal bureaucratic maneuver to annul the core of the welfare reform legislation. The Obama Administration simply declared the TANF work provisions null and void and has granted itself unlimited authority to recraft the work standards in any manner it chooses. As CATO’s Michael Tanner documented, since President Obama took office, federal welfare spending has increased by 41 percent, more than $193 billion per year. Despite this government largess, more that 46 million Americans continue to live in poverty. Despite nearly $15 trillion in total welfare spending since Lyndon Johnson declared war on poverty in 1964 the poverty rate now stands at 15 percent, and is perilously close to where we began almost 50 years ago. And that is how the left wants it, and far from moving people out of poverty and off food stamps and TANF Obama’s food stamp economy is designed to keep people dependent and grow the number of dependent “clients” for government programs. As Heritage’s Robert Rector noted, welfare reform under President Richard Nixon was blocked by left-wing opposition to work requirements. Throughout the 1980s, liberals in Congress blocked President Ronald Reagan’s efforts to require AFDC recipients to work. In the 1990s liberal opposition was so strong that President Clinton vetoed welfare reform twice before finally signing it. The left wing of the Democratic Party has always opposed welfare reform and always opposed policies to spur private sector economic growth not out of compassion for the poor and unemployed, but because the “hospital model” of a vast reservoir of unemployed and unemployable dependent “clients” is a sure reservoir of votes for Democrats. Submitted by sir_aslan on Fri, 01/24/2014 - 15:50. AMERICANS CANNOT AFFORD TO EAT AT MCDONALD'S ANYMORE !! Think about it? ?